Doesn't seem like much good could ever come of this, really. Ask Plaxico Burress, or this guy. Mountain Safety Council chief executive Darryl Carpenter said people shot themselves accidentally "surprisingly very little." 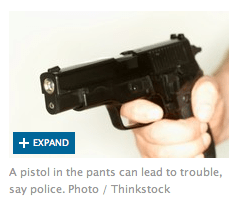 But there was one main message he said: "Don't put your loaded firearm in your pocket."